The highest quality fresh and wild seafood sourced from the Mediterranean and Africa predominantly. Seafood platters served on ice with condiments and wild seafood boxes delivered to your door. All our meat, chicken and lamb has been handpicked to ensure it is the highest quality. It is all hormone and antibiotic free. You will taste the difference. Choose from our suggested beef, chicken or mixed meat boxes and have all your protein covered for the week. We also can offer a combined beef, chicken, lamb and seafood box. Or create your own and save. Exceptional tenderloin beef rubbed with Dijon mustard, covered in mushroom duxelle, wrapped in a savoury crepe and finally wrapped in our very own hand made pastry – creating a luxurious and very special way to enjoy beef. The legendary home made pies are made from scratch using the finest ingredients. Just because you eat a pie doesn’t mean the filling shouldn’t be of the highest quality. From black angus pepper steak to broccoli and stilton, it will be hard to just eat one. Some of the finest artisan cheeses available in Dubai are sourced from France, Italy and the UK. We challenge you to try our halal cold cuts that are simply stunning. Purchase by weight or let us prepare you a cheese and or cold cuts platter..
Hand made range of vegetarian products including veggie burgers, sausages, lasagna, moussaka, pies, salads, pastas and sides. We can be your sous chef prepaing your meat or fish ready for you to cook along with a selection of side dishes ready to eat or finish in an oven. Or let our chefs fully cook it for you ready to eat and delivered to your door. Ready cooked meal plans that are designed by our nutritionist, body transformation coach and Triple G’s chefs combine gourmet food with calorie and macro controlled food for the month. Whether it's a Villa party, corporate event, boat party or just a few friends round for dinner, we can design and cater for every occasion. Whatever your requirements, we can provide a one stop solution. Our Aussie roots mean that we love to BBQ. Choose from our selected BBQ packs suitable for all budgets. Our finest meats and seafood, prepped and marinated ready to cook. Chose from a number of sides to ensure the BBQ is a gourmet success. Whether it's Italian specialties such as olives, antipasti, sauces and pastas; condiments such as mustards and pestos; beverages such as coffee and mixers; or desserts, Triple G has something for every occassion. Enjoy an amazing festive feast in the comfort of your own home. A full menu of whole turkey's, turkey crowns, beef wellingtons, roasted beef joints with all the trimmings. Plus a selection of our finest artisanal cheeses and fresh seafood. 2 eggs (poached, scrambled or fried), veal bacon, hash brown or rosemary potatoes and a coffee for AED 35. Or a veal bacon and egg roll and a coffee for AED 35. From 8am on Friday and Saturdays. 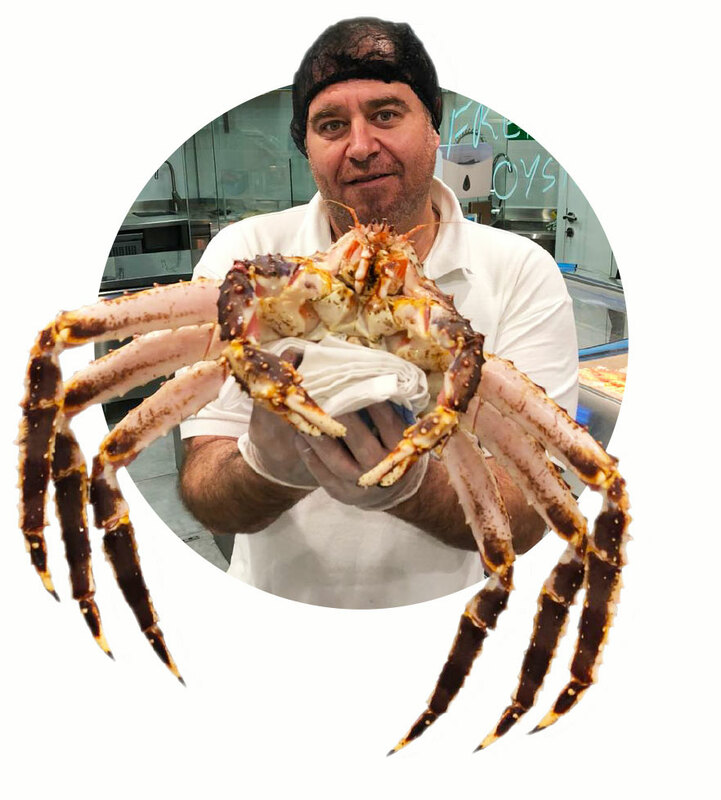 Having struggled to find high quality ingredients in the supermarkets in Dubai and particularly on the Palm, I established Grand Gourmet Grocer to provide restaurant quality food that has been hand selected by myself to give food lovers in Dubai a new alternative for eating at home or catering for parties. The majority of our fish is wild, our Australian beef, Australian Lamb and New Zealand chickens are of the highest restaurant quality and hormone and antibiotic free at an affordable price. Our artisan cold cuts and cheeses take you to Italy, Spain and France and our speciality market provides the perfect compliment to our ready to eat food or for you to use as an ingredients while preparing your own meal. Let us prepare meals for you to cook at home or let us cook and deliver meals to your door. Our motto is 'Gourmet Food Made Easy' we are entirely flexible and committed to providing you the highest quality, hand picked food in Dubai. Restaurant quality food to enjoy at home. We have a passion and love for high quality, fresh and well prepared food and are committed to ensuring that every experience with Grand Gourmet Grocer is of the highest quality. In the unlikely event your experience is not wonderful, please call myself on 055 544 0458 to ensure that your next experience is.